Is your commute a stressful nightmare spent sat in traffic or dealing with unreliable public transport? Do you worry about not getting your daily dose of exercise? If you have got a bike in your garage that hasn't seen daylight for months, or only gets used for weekend rides, you could kill both of these birds with one commuting stone, save some cash and do your bit for the planet. For many people, riding in traffic is one of the main reasons they don't cycle. It can seem daunting as a beginner, but following the basic rules of the road (see tip box below) will ensure you ride safely, responsibly and respectfully every time you get on your bike, helping to reduce the chance of an accident happening. Find a more experienced commuting buddy at work to ride with, or gain more confidence riding in traffic by attending a Bikeability Course. The typical travel time for a cycle commute is 22 minutes, however if your journey is much longer than this, or you feel you are not yet ready to do the journey all in one go, don't be put off. Drive or take the train part of the way to work, then cycle the rest of the journey until you are confident in your fitness to ride the full distance. Once you start to feel your fitness increasing, you could try getting off the train a stop earlier each week or parking an extra mile away to gradually build up the distance. Wear whatever is comfortable to commute in and, if you are not riding hard and your commute is relatively short, you can even wear your work clothes. If your commute is more than about 10 minutes, you should consider some padded shorts. You can wear them under baggy shorts or even normal clothes if you want, but your backside will thank you. A decent waterproof jacket is always a good investment as well. Unfortunately not every workplace has the luxury of a warm shower and changing facilities. So for those of you that have to go without, you might wonder how you can ride into work and still manage to feel fresh. An essential item and without a doubt the next best thing to having a shower, is baby wipes. They not only clean you off but many are scented as well. Micro fibre towels are also handy to wipe yourself down as they fold up small so are easy to carry and they also dry out quickly. Also, do not forget deodorant. For women, a big hassle can be sorting out your hair. If you are worrying about turning up with sweaty helmet hair, an essential item to have is dry shampoo. A quick spray refreshes your hair and absorbs the sweat. Having a spare set of toiletries and if needed, hair appliances at work, means you won't have to carry them in everyday, adding unnecessary weight to your rucksack. Commuting might take a bit of planning and some trial and error to begin with but you will soon have your routine sorted and, once you start to feel the benefits of your new cycling regime, you won't think anything of it. If you are unsure how long your commute will take, try a weekend dummy run. There will be less traffic, but it will still give you a good idea of the time required. 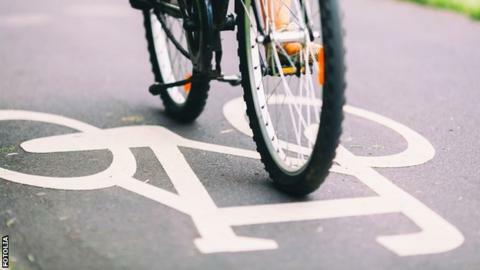 With many towns and cities becoming more cycling friendly, you can often find online resources showing cycling routes to help you to plan your journey. Also, cycling social media sites, such as Strava, feature planners which find the routes most commonly frequented by cyclists. Would you be riding in the dark? Bike lights, hi-viz clothing and reflectors will make you visible to other road users. Plan your route choosing well lit roads, with lower traffic volumes. Traffic free routes, such as canal towpaths, that can be good in daylight, are often unlit at night and are best avoided. Bad weather can be unpleasant and hazardous to ride in. Use lights and wear bright clothing in rain and be aware that the roads could be slippery. Unless your route sticks to well gritted roads, on icy and snowy days you are probably better leaving your bike in the shed. Make a habit of checking the weather forecast each evening. Obey road markings and the Highway Code Road markings apply as much to you as a cyclist as they would if you were in a car. Never cross solid white lines in the middle of the road, always obey stop lines at junctions, take notice of one way roads and don't ever jump red lights. Position yourself correctly Don't ride in the gutter. Most of the time you should ride roughly in line with the near side of cars. If you need to overtake, turn, change lanes or avoid obstructions, occupy the middle of your lane. Ride predictably Hold your line and position in the road. Do not weave from side to side. Always look and signal if you intend to move. Look ahead Always try to look ahead down the road and anticipate any potential problems or dangers. If you know you need to change lanes or have a right turn approaching, look and move early. Pick your route A bit of route planning allows you to avoid busy roads and to make use of available cycle paths. Stay off the pavement Unless clearly marked as a shared cycle/pedestrian lane, cycling on the pavement or any foot-path is illegal and dangerous both for you and pedestrians. Make yourself visible The earlier other road users see you, the more time they will have to take appropriate action. Wear bright clothing and, in low light conditions, use lights and reflectors. Get some instruction Attend a Bikeability Course to learn the necessary skills to ride confidently on the roads. 1. Find out more about cycle training, kit, techniques and nutrition at British Cycling's Insight Zone. 2. Go to our Activity Finder to find cycling near you. 3. Share your story and inspire others.